The AR8000, AR8000DX & AR8000DX PCB are no longer available but this page remains for reference. The AR8000 is the result of AOR's long term ambition to produce a new breed of radio receiver which combined full computer compatibility with advanced wide-band radio receiver technology. With the introduction of the new AR8000, AOR have broken the mould of conventional radio receiver design. At first glance the AR8000 in its static form may look no different to any modern hand-held scanning receiver, but the similarity ends there...just as soon as the receiver is switched on!! Initially you are greeted with the opening welcome message on the AR8000 multi-function liquid crystal display "WELCOME TO THE WORLD OF AR8000 RECEIVER", in a similar way to a sign on message displayed by your personal computer. This new experience immediately demonstrates to the new user and discerning radio listener that the AR8000 is no ordinary radio but THE NEW CONCEPT in radio design. The modern new cabinet design measures approx. 152mm (h) x 69mm (d) x 40mm (w) excluding projections and weighing only 350g including NiCads (but not aerial). 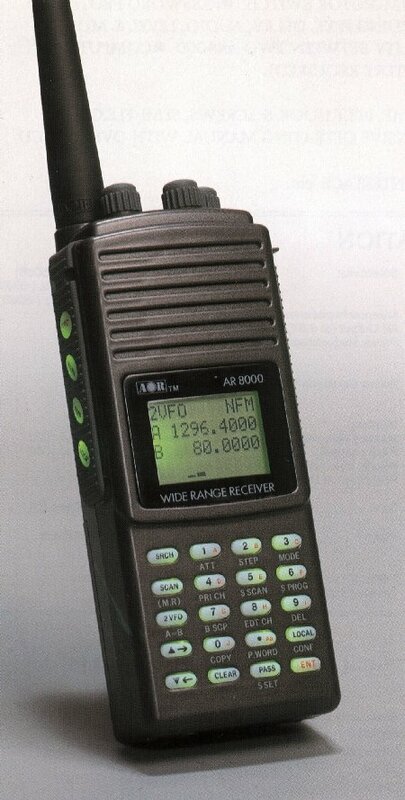 The AR8000 is a highly sensitive hand-held receiver boasting a very wide frequency coverage of 500KHz to 1900MHz without gaps in the range (actual acceptable frequency input from 100KHz). Step size is programmable in multiples of 50Hz for smooth tuning. The all mode reception provides AM,USB,LSB,CW,NFM and WFM. As you might expect from a radio receiver of this calibre, an independent 4.0kHz SSB filter is fitted as standard and the USB/LSB modes use true carrier re-insertion with correctly calibrated frequency read-out (not offset by 1.KHz). A custom manufactured ferrite bar aerial is neatly installed at the top of the receivers cabinet to enhance receive performance when listening in population centres to Medium Wave services or when commentary is provided at aishows and motor sport events. The highly visibility LCD is of a new dot matrix format which enables many new facilities to be used, many of which have never been seen before especially on a hand held design. Two VFO frequencies may be displayed on the LCD simultaneously, one providing a stand by frequency available for quick transfer (similar to commercial aviation built- in radio transceivers). When frequencies are entered, ALPHANUMERIC comments may be stored along with frequency, mode & attenuator status simplifying the job or recalling and identifying memory channels. The LCD provides four lines of display so that additional facilities may be provided and displayed at the same time, these include a signal strength bar meter and a band-scope showing band occupancy. The AR8000 is equipped with almost every conceivable operating feature but operation remains easy thanks to a massive new microprocessor. A total of 1000 memory channels are provided which are divided into 20 banks, each having 50 channels. AOR have chosen to allocate 50 channels per memory bank (rather than the more conventional 100) based on findings that most radio listeners prefer fewer channels per bank but more banks for simplified operation. The AR8000 will search and scan at a very respectable (and fast) maximum speed of approximately 30 increments per second. You may even enter "special" frequencies into memory banks where they may only be recalled by entering a user definable "PASSWORD"....this will stop preying eyes. The AR8000 is truly a button pushers delight but operation need not be difficult. As well as a comprehensively illustrated operating manual and UK quick reference guide, the AR8000 has two operating modes: NEWUSER and EXPERT. As already mentioned, the multi-function LCD provides many new facilities but the receiver has a few more tricks up it's sleeve. Not only can you connect the AR8000 to an external computer for remote control, you may connect two AR8000 receivers back-to-back so that data may be copied from one to another (small interface required for remote data access). There are a variety of scan/search commands to link banks, scan by mode, programmable delay scan, priority, auto memory store, step offset and a programmable power save circuit to increase duration of operation from the NiCads. Keypad illumination extends to the side panel keys and maybe switched in a jumber of ways. Illumination "permanently On" for mobile operation is possible, a specially selected heavy duty regulator has been fitted to ensure the receiver will continue to operate reliably even with the illumination on. The AR8000 can be used in conjunction with the Optoelectronics Scout or Watson Super Searcher frequency counters for automatic and instantaneous tuning of any detected frequencies. The optional SAC-8000 cable is required or alternatively a small modification is required to the AR8000 (the addition of a small 2.5mm socket). This modification is available FREE OF CHARGE to all customers ordering the AR8000. The mechanical assembly of the AR8000 will be a sheer revelation to any radio engineer. Surface mount technology has been employed throughout the receiver which is constructed of plug in modules. This will ensure the highest levels of performance, reliability and serviceability. The AR8000 will certainly stand out in a constructional beauty contest. The JAV-232 Interface is a high quality interface suitable for many receivers but especially the AR8000. Features include Squelch Detect, Audio Output & Remote Tape Record socket. The RS-8000 is a low cost option for those who just wish to connect the AR8000 to a PC without the additonal features found on the JAV-232. Built in a DB-25 socket the interface is supplied with about 1.5m of screened cable and a FFC lead to connect to the AR8000. CU-8232: RS232 Computer Interface - The AOR CU-8232 interface for computer control. Considerably more expensive that either of the above two options the unique feature of the CU-8232 is that it will also allow two AR-8000's to be put back to back and the contents of one copied to another. This is done without the use of PC so can be done out in the field if required. If you are perhaps travelling and visiting a fellow AR8000 owner there is no need to enter all the local frequencies by hand - just copy the required contents from one to the other ! "DX-8000" PCB board - The AR8000DX we have available is a standard AR8000 fitted with a custom built PCB that allows the narrower SSB filters fitted to the AR8000 to be used when in AM mode. This can be useful to those who use the AR8000 for listening to AM Broadcast transmissions of the HF bands. The PCB board used in the AR8000DX has not been available in the past - the only way to get it was purchase the AR8000DX complete. DS-8000. This speech inversion board will allow basic analogue inversion (not digital encryption) to be heard on the AR8000. It is a custom built PCB that just plugs onto a free connector block on the RF Board of the AR8000. They are available from stock and cost £69.00 Pounds ($100 approx). LC-8000: Manufactured by a local Company these are a robust real leather carry case that can also be worn on a belt. Originally they were "open" at the front where the keypad and screen are however we know have a Mark 2 version which has a clear plastic front to protect the screen and keypad. Ben Saladino Shareware Radio Manager for Windows (AR8000, Icom, OptoElectronics etc).